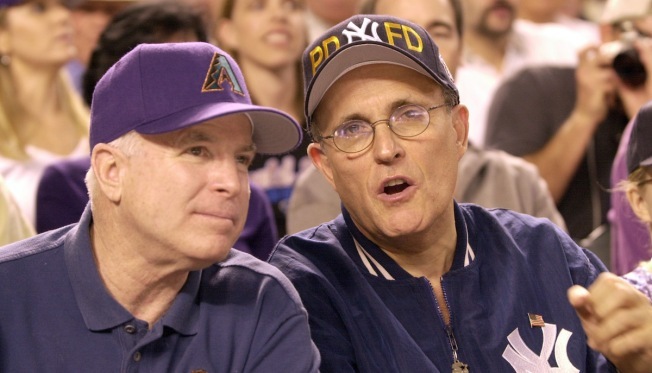 Sen. John McCain, R-Ariz., left, and New York Mayor Rudy Giuliani chat during Game 6 of the World Series between the New York Yankees and Arizona Diamondbacks Saturday, Nov. 3, 2001, at Bank One Ballpark in Phoenix. The sight of John McCain sitting in the stands at Chase Field became so commonplace few people seemed to even notice. The senator from Arizona would get handshakes and take pictures with fans, but he was there just to be one of them, cheering on the home team. McCain died Saturday after battling brain cancer and the Arizona sports community mourned him across the Valley of the Sun. He was 81. "Rest in peace to an American hero, statesman, servant of the people, and dear friend," Arizona Cardinals receiver Larry Fitzgerald posted on Twitter. "Godspeed Senator McCain. My prayers for Cindy and the beautiful McCain family." He was a huge Arizona Diamondbacks fan, attending the expansion draft in 1997 and the World Series in 2001, when his team took down the mighty New York Yankees. McCain even attended spring training workouts. "John McCain has always been a member of the D-backs' family and was one of this team's biggest fans since day one," Diamondbacks President and CEO Derrick Hall said. "He was in attendance at the expansion draft, the World Series and countless other games, remaining a fan through thick and thin. I am honored to consider him a friend and we will miss seeing his smiling face in the stands and our heartfelt thoughts go out to his entire family." McCain had a strong connection to Fitzgerald and the Cardinals. He attended Cardinals games and made an appearance at training camp before the 2017 season. Fitzgerald became friends with the senator, penning a tribute to him last Christmas and visiting him this year. "Arizona, the United States and the rest of the world will not be the same without the voice of Senator John McCain," Cardinals President Michael Bidwill said. "We are heartbroken by his passing, but know that the character, courage and conviction that he demonstrated throughout his life will endure forever." McCain was an avid supporter of the Arizona Coyotes and worked to keep the hockey team in the Valley after the former owner filed for bankruptcy. The Coyotes honored McCain with a bobblehead at a military appreciation night in 2011 and the senator dropped the ceremonial first puck before the game against the Montreal Canadiens. "The entire Coyotes organization is deeply saddened by the passing of Senator John McCain," the team said. "Senator McCain was a great American hero and patriot who dedicated his life and career to public service. Senator McCain was a maverick who fought for what he believed in and represented the very best ideals of the United States senate. He was a courageous leader who served Arizona and the United States with pride." McCain also attended Phoenix Suns games, even donning an orange shirt with wife Cindy to join the rest of the fans. He also narrated the video for the Suns' 50-year anniversary. "John McCain was an American hero, an American icon and a friend," the Suns said. "As we collectively mourn his passing, we also celebrate his unparalleled leadership and dedication to service. Additionally, his courage, perseverance and ability to overcome adversity, in every aspect of his life, will continue to inspire us all." McCain also was a supporter of the WNBA's Phoenix Mercury, Arizona State and University of Arizona athletics.